An undergraduate of the Ekiti State University (EKSU), Ado Ekiti, Ayodele Temilade, was hacked to death bysuspected cultists. According to reports, the corpse of the deceased was discovered at the gate of the school around 10pm on Sunday. Nobody could explain how the corpse was deposited there. A critical look at pictures of the corpse posted on the social media revealed that the head of the victim was severed and the body inflicted with several machete cuts. Confirming the incident, the PPRO in Ekiti police command, Mr. Alberto Adeyemi, said the command received the report of the incident on Monday morning and had since taken corpse to the mortuary. However, the Acting Director, Information and Corporate Affairs of the institution, Ajibade Olubunmi, who also confirmed the ugly incident, added that Temilade’s corpse was found at the gate of his residence. This is contrary to the earlier claims that the corpse was dumped at the school’s gate. 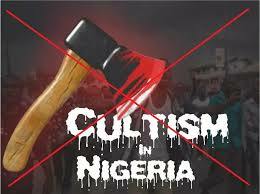 A statement by Olubunmi on Monday, said the management of EKSU has declared war against cult activities in the school. Tagged “Operation no cultism in EKSU”, the statement said the Vice Chancellor, Prof Bamidele Oye made the declaration after an emergency security meeting in response to noticeable upsurge in cultists’ activities in the institution. “All suspected cultists will be rounded up, investigated and dealt with according to the University’s extant rules and regulations as well as prosecuted in the law courts”, he said. The statement further added that the VC also directed that names of suspected cultists in the University would be compiled for necessary action. Can You Eat Of This Cake?